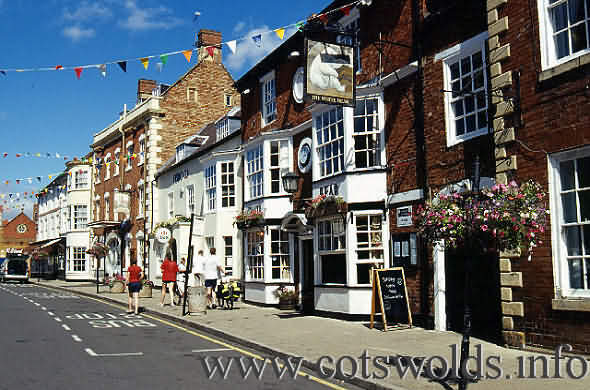 The small market town of Shipston-on-Stour is situated in South Warwickshire and ideally located for visitors to the North Cotswolds and Stratford-upon-Avon. It is surrounded by places of interest including Chipping Campden, Broadway, and Moreton-in-Marsh. The towns name derives from being known in ancient times as 'Sheep-wash-Town'. Shipston was for a long time an important sheep market town and after the demand for local wool began to diminish the town continued to flourish thanks to the opening in 1836 of a branch line from the horse-powered tramway built a decade before to link Stratford with Moreton-in-Marsh. The line became a modern railway in 1889. The town was also an important coaching town and many of the inns from that era surviving in the area of the High Street. Shipston today is a charming historic and thriving town with interesting and unusual features.. It is becoming increasingly popular with tourists due to its wonderful mixture of shops, pubs, restaurants and hotels. Shipston was a working Wool Town and developed many woolen skills, including those for making tapestries including the famous Sheldon Tapestries in neighbouring farming hamlet of Barcheston. which became central to the history of English tapestry making. It is today officially commemorated by the 'Wool Fair' which takes place on Spring Bank Holiday Monday. In the Tudor period the little hamlet of Barcheston on the outskirts of Shipston was the first manufacturing home in England for the weaving of magnificent woollen tapestries. They are also known as the Sheldon Tapestries. They are profusely decorated with flowers and mythological motifs and often highlighted in silk. Technically, for that period, they were unrivalled throughout the land. Unfortunately very few have survived. 1. Touring the North Cotswolds villages and towns. 2. Stratford-upon-Avon is only 8 miles away. 3. Warwick Castle 25 minutes drive time. 4. The beautiful gardens of Hidcote Manor and Kiftsgate are closeby. 5. Shipston Proms held over two week period in June/July and hosts local musicians of all styles and ending with a street party and live music in the square. 6. The Wool Fair held on Spring Bank Holiday Monday. 7. Shipston Mid-Summer Festival in July with traditional music and dance.